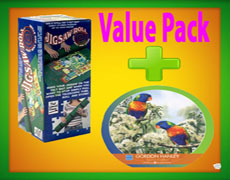 Wasgij Jigsaw puzzles were produced and manufactured by Jumbo Games, which is the UK's number 1 adult jigsaw puzzle range since the year 2005. This range is quite different when it comes to the traditional rules of puzzle making. They have broken the mould and asked puzzlers to use their imagination, rather then piecing the puzzle to look to same as the illustration on the box. The third of four concepts from Wasgij is Wasgij Mystery, which asks us to piece together what we think may happen to the set characters.